With Valentines Day fast approaching, the race is on to get flowers, chocolates, book a romantic meal at your favourite restaurant or any other special presents you may have lined up for your significant other. 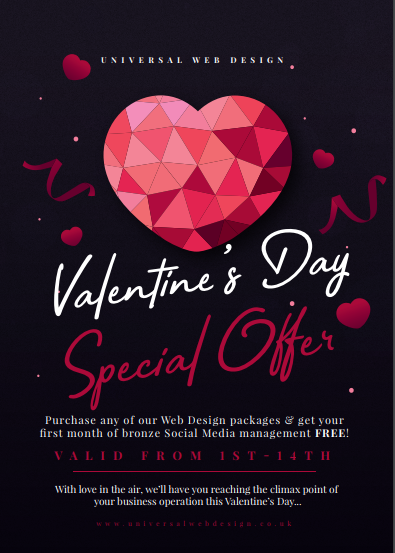 But hang on a minute, why not treat your loved one (your business) to a new website with FREE social media for one month! When you purchase either an e-commerce or brochure website build, you’ll be able to receive a 12 months of Bronze Social Media for the price of 11, giving you one month of updates and follower development completely FREE! Having a professional online presence is vital for future business success. A bespoke website essentially acts as the heart of your online dealings and gives your customers a base to access your products and/or services. However, you can have the best website in the world, but if nobody can see it, what’s the point in having one? There needs to be the chemistry between a website and it’s marketing methods – but who can make it a match made in heaven? We can successfully market your new website through advertising avenues such as SEO, PPC, Blog Management, Email Marketing and you guessed it, Social Media! Our Social Media Management package is simple and effective, reaching your target audience across online platforms such as Facebook, Linkedin, Twitter and Instagram. We produce the professionally written content, set-up any accounts you don’t currently have, research your competitors and even send you reports at the end of each month to track your progress. 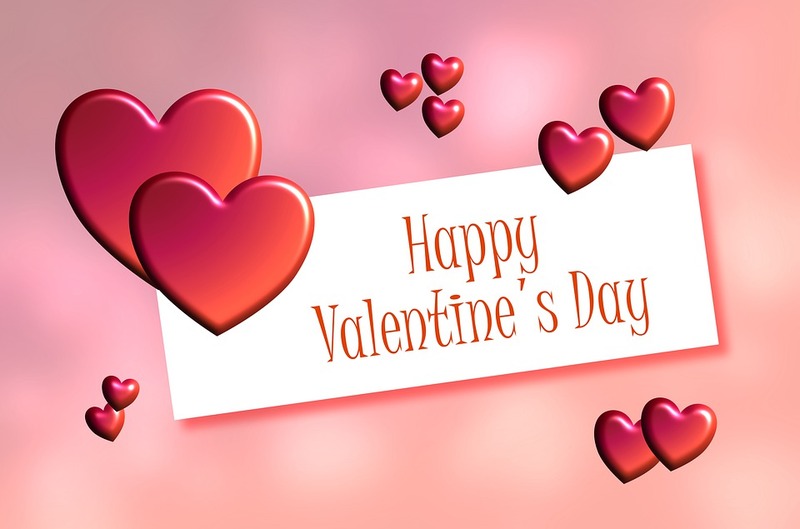 If you’re still looking for the one this Valentine’s Day to sweep you off your feet, rest assured the team at Universal will cater to your every online need. From designing your new website to sitting down with you in our office and creating an effective marketing strategy to support. So, why not take advantage of our Valentines Day special offer! 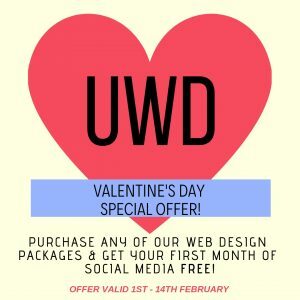 From the 1st to the 14th February, you’ll be able to make sweet love to your business and it’s future aspirations when you tap into the processes of Universal Web Design. With love in the air, we’ll have you reaching the climax point of your business operation this Valentine’s Day.